Atlantic Premium Shutters is well known for crafting fully functional shutters that are architecturally correct and historically accurate. These shutters will enhance any home with a wide range of style, size and color choices. Hurricane storm-rated shutters offer the same beauty and graceful charm when they are opened and the added storm protection when they are closed and secured. Hurricane storm-rated shutters incorporate the protection of the most advanced, durable shutter materials, a strong polycarbonate layer, and storm bars. The shutter offering includes options that meet the IRC, IBC and State of Florida building codes. 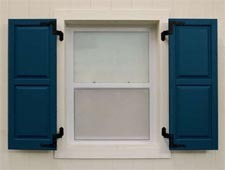 These storm-rated shutters have been tested by an independent test laboratory that is Hurricane Board and Batten Shutterscertified by the State of Florida and Miami-Dade County. An outside Professional Engineer has also certified that the storm shutters were tested in accordance with the testing protocols identified. Atlantic Premium Shutters is a division of The Tapco Group, a leader in the building materials industry with a history going back more than forty-five years. The Tapco Group is part of the Construction Materials business unit of Headwaters, Inc., a billion-dollar company traded on the NYSE. The Vertical Storm Bar System meets the State of Florida Building Code 2006. 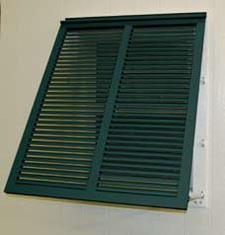 The storm system is offered with fiberglass and composite shutters in louver, raised panel or board and batten styles. The shutters can be ordered in 1/8" increments to a maximum of a 60" wide x 102" tall window opening. The maximum shutter width is 30". The system consists of two shutters with an 1/8" thick polycarbonate panel that is permanently attached to the back of each shutter. A vertical storm bar that fits into mounting brackets on the top and bottom of the window opening and fits between the two closed shutters. The mounting brackets and storm bars are removable and can be installed when a hurricane threat occurs.Storm shutters with the Vertical Storm Bar System have been independently tested to a Design Pressure (DP) of 60 PSF. The Bahama Storm System meets the State of Florida Building Code 2006. 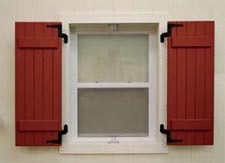 This storm system is offered in fiberglass material for bahama shutters. The bahama shutters can be ordered in 1/8" width and 1-½" height increments to a maximum of 60" wide x 103" tall. An 1/8" thick polycarbonate panel that is permanently attached to the back of the shutter. A camelback locking system, which has been specifically designed for Bahama shutters, is installed along the sides of the shutter. Bahama Storm Shutters have been independently tested to a Design Pressure (DP) of 60 PSF. 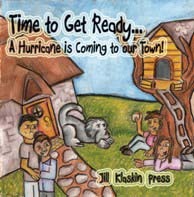 Hurricane Books With hurricane season just around the corner, the timing of this new release is perfect preparation for children living in coastal communities. Last years hurricane season was very mild with just nine named storms, the fewest in 12 years. But many forecasters say that this year will be worse. Hurricane season starts June 1st. and ends November 30th. Time to Get Ready...A Hurricane is Coming to Our Town! is dedicated To the Children...the most vulnerable people affected by natural disasters. A portion of all book sales will be donated to charitable organizations such as, Feed The Children. To learn more about Time to Get Ready...A Hurricane is Coming to Our Town! visit www.time2getready.com.